This fine early 17th-century woman's waistcoat is particularly significant because it is shown being worn in the Portrait of Margaret Layton (museum no. E.214-1994), attributed to Marcus Gheeraerts the Younger (1561-1636) and displayed alongside it. Waistcoats were long-sleeved upper garments, opening down the front and fitted at the waist using inserted gores. They were often made of linen and splendidly decorated as in this example. Margaret Laton or Margaret Layton – What's in a name? When the V&A acquired the jacket and portrait of Margaret Layton in 1994, we used the version ‘Laton’ following the example set in 1933 by V&A curator Albert Kendrick. However, according to documents and monuments of the Layton family in Rawdon, Yorkshire, and the Dictionary of National Biography, the name was always spelled with a ‘y’. We are now making corrections in V&A labels, brochures, publications and on the V&A website. In the portrait, Margaret Layton wears the waistcoat with an Italian needlelace collar and cuffs, a black velvet gown, a red silk petticoat and a whitework apron. As with many women of this period, we know very little about her life, other than her recorded connections to her father and husband. 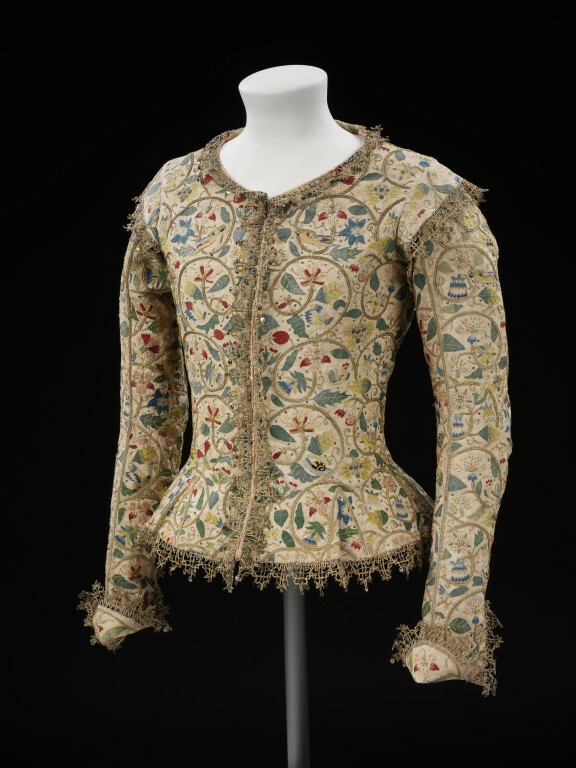 The waistcoat has long, tight sleeves, narrow shoulder wings, semi-circular cuffs and a small curved collar at the back neck, dating it to about 1610. Made of linen, it is hand sewn and lined with coral silk taffeta. Originally the jacket was fastened with pink silk ribbons. In the 1620s, an edging of spangled silver-gilt bobbin lace was added. Fragments remain of the original silk ribbons used for fastening. The waistcoat is embroidered in detached buttonhole, stem, plaited braid, chain, couching and dot stitches, with knots and speckling, with coloured silk threads, silver-gilt threads and spangles. Although the waistcoat was made about 1610, the portrait was painted more than 10 years later. By this time, waistlines had risen. Margaret Layton adapted to the new style by raising her petticoat and covering the lower half of the waistcoat. A woman's waistcoat with long, close-fitting sleeves, narrow shoulder wings, semi-circular cuffs and a small curved collar at the back neck. The torso is cut in three pieces: two front side pieces and one back panel with five gores inserted at the lower edge to give ease over the hips. The sleeves are cut in two pieces with a slit at the wrist. The whole garment is lined with coral silk taffeta. The whole garment is embroidered in an all over pattern of scrolling vines in silver-gilt plaited braid stitch from which spring a variety of flowers, fruits and insects worked in coloured silks and silver-gilt thread. In the 1620s, an edging of spangled silver-gilt bobbin lace was added. Fragments remain of the original silk ribbons used to fasten the waistcoat. Embroidered using detached buttonhole, stem, plaited braid, chain, couching and dot stitches, with knots and speckling, with coloured silk threads, silver-gilt threads and spangles.. 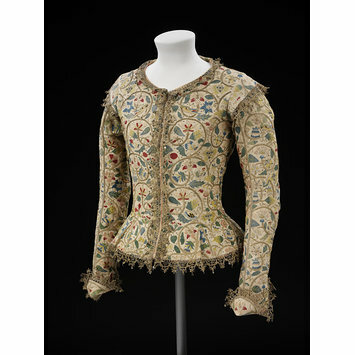 This waiscoat was owned and worn by Margaret Layton (probably born about 1590, died 1641), wife of Francis Layton (born 1577, died 1661), Yeoman of the Jewel House during the reign of James I, Charles I and Charles II. An portrait by an unknown artist, dating from the 1620s, shows Margaret Layton wearing this waistcoat. When the V&A acquired the waistcoat and portrait of Margaret Layton in 1994, the version ‘Laton’ was used following the example set in 1933 by V&A curator Albert Kendrick. However, according to documents and monuments of the Layton family in Rawdon, Yorkshire, and the Dictionary of National Biography, the name was always spelled with a ‘y’. Purchased. Registered File number 1994/644. This waistcoat is a fine example of the type of garment worn for formal day wear for Englishwomen of the late 16th and early 17th century. In the portrait, the waistcoat is worn with an Italian needlelace collar and cuffs, a black velvet gown, a red silk petticoat and a whitework apron. The embroidery pattern is typically English of the late 16th and early 17th century featuring a variety of plants, flowers, birds and insects based on images in pattern books, herbals and emblem books. Robertshaw, Wilfrid. An Early Local Portrait. Bradfor:d: "The Bradford Antiquary", New Series, Part XXXV, 1950.